I have been traveling a lot lately and one of the things I do enjoy is trying out the local cuisine. My first stop was in Galveston, Texas. Now to be honest with you I love seafood and I had been dreaming of an oyster poor boy way back since last September. 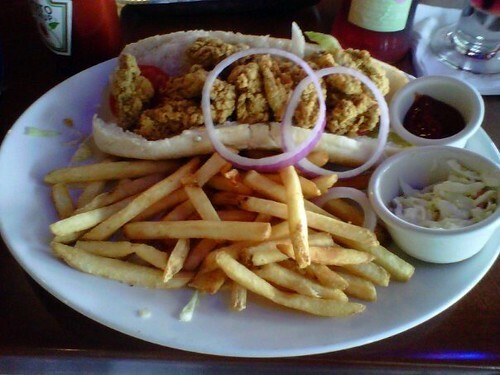 So the first thing I did upon arrival in Galveston was to drive down the Seawall and find the restaurant that I think might serve up an oyster poor boy. We stopped at a restaurant called “Fishtails” across from the new pleasure pier that is being built. I ordered the most wonderful oyster poor boy and I savored every morsel! The next day we got on our ship and began our voyage to Honduras, Belize and Mexico. Our first stop was in Honduras. 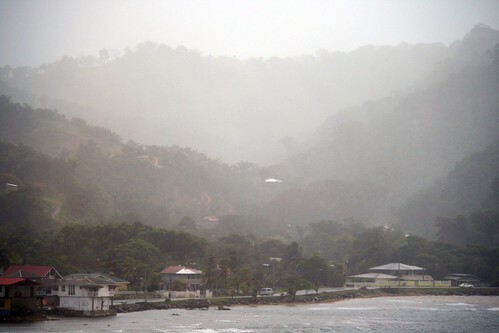 It was a cold, foggy, rainy day when we first arrived. The beautiful green mountains were draped in a white mist. The rain clouds slowly drifted away and we took a bus to a pretty little beach. While we were there we had lunch on the beach. 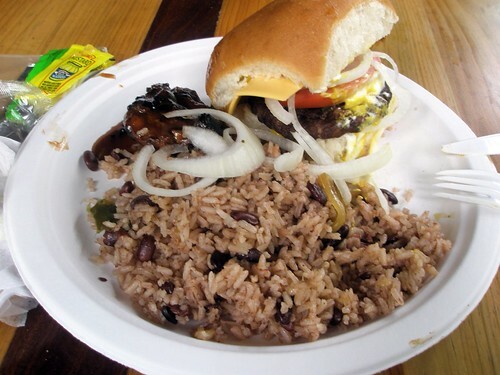 While you may think that hamburgers are more American than anything else, what was different was the red beans and rice served with it. It didn’t taste at all like the Cajun red beans and rice. It had a sweet taste to it. It was really good! We also had a small piece of chicken dipped in a sweet barbeque sauce. In Belize we didn’t have time to stop and eat. I really wanted to try some conch. I have never eaten it before, maybe next time! I did have time to do a little shopping. I love coffee. I saw this bag of coffee beans and just had to pick it up. I have been drinking this since we got back. I grind up the coffee beans fresh every morning. Starbucks move over! 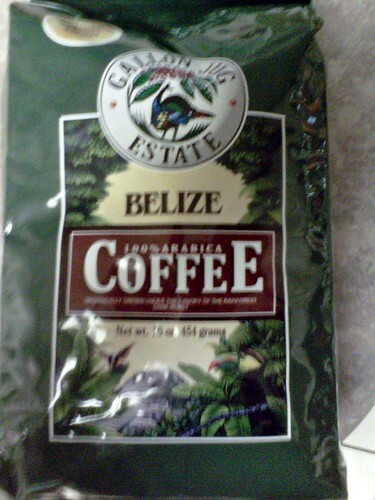 The coffee in Belize is wonderful! 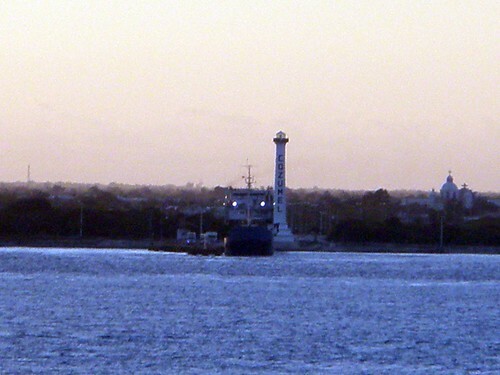 Then it was on to Cozumel, where we docked there early the next morning. 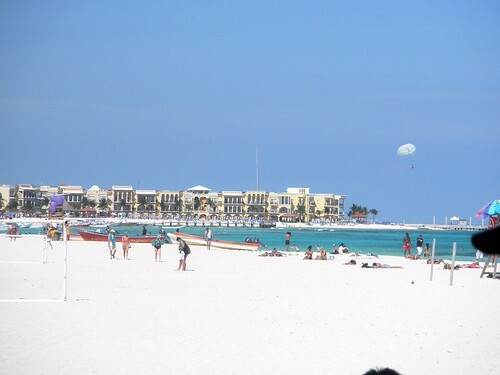 From Cozumel we got on another boat and went to Playa Del Carmen. I think this is the most beautiful beach I have ever seen. I could have stayed here for the rest of the vacation! In Playa Del Carmen we got on a bus and went to Xel-Ha. 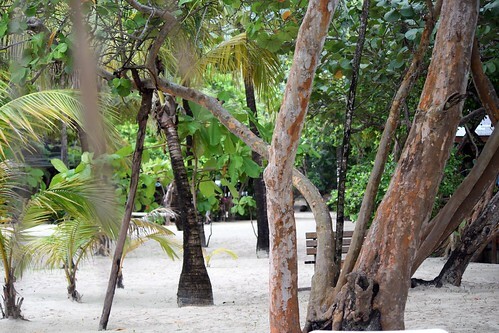 It is a beautiful little place with a huge lagoon that is wonderful for swimming and snorkeling. 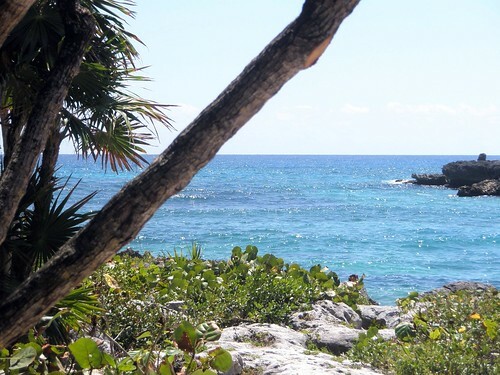 There are lots of underwater caves to explore and cenotes to swim in too. The water was so clear that you could see right through it. Snorkeling wasn’t really necessary! 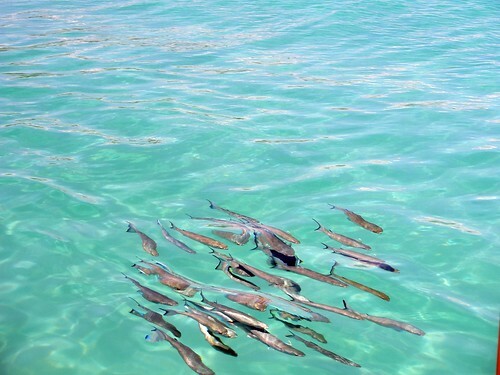 You could get in the water and swim with all the animals that were swimming in the lagoon like dolphins, stingray (gulp!) and there were some Beluga whales here too! 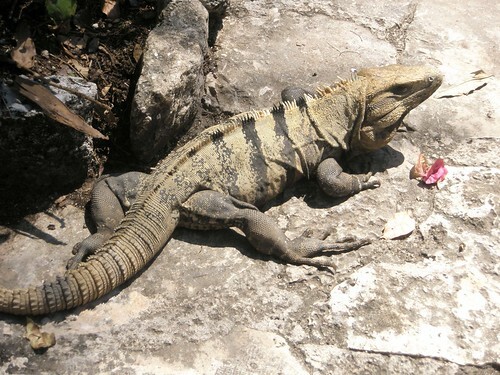 Mexico isn’t Mexico without a few iguanas hanging around. Mexicans actually eat these things. They say it tastes like chicken and NO I did not eat one!! 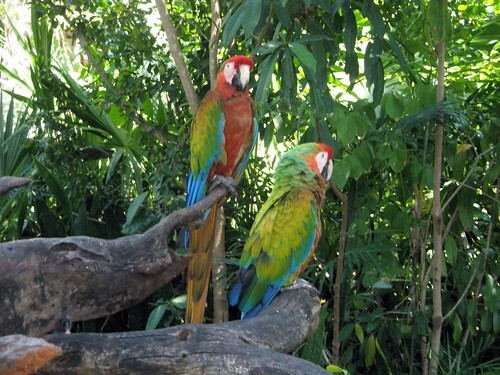 There were lots of Macaws and Toucans hanging around too. They are such beautiful birds! With all that swimming and sun it is easy to build up an appetite! We stopped and ate lunch in Xel-Ha. 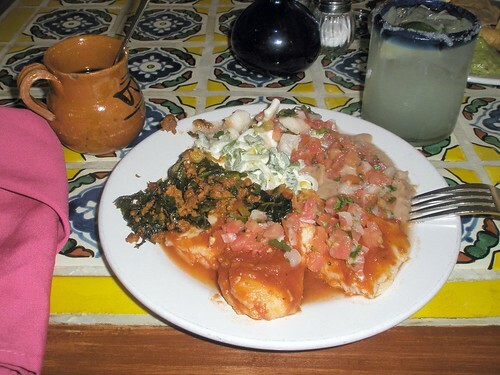 The front part of my plate is Fish Vera Cruz. I just couldn’t seem to get enough seafood!! Going clockwise from the fish is a sausage and bean dish. I forgot what it was called but it was delicious! Next was a poblano and sour cream dish. This dish was yummy and I may try to make this one at home sometime. Next to that is Ceviche which is raw fish. Normally, I do not eat anything RAW in foreign countries but I do like Ceviche! I survived! Try it at least once. If you don’t, you won’t know what you are missing! Then next to the Ceviche is the old stand by of refried beans. Yup, you also see a Margarita on the rocks! After all, it is vacation time! 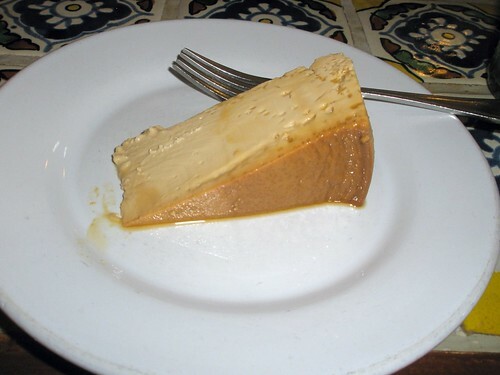 And then of course, to top it off I had some flan. Oh was it wonderful! The sugar and vanilla that is in Mexico tastes so different from what we have here in the US. The flavors are just wonderful! BTW, I do use Mexican vanilla in all my recipes. Just can’t bet it!! Posted on March 24, 2012 March 31, 2012 by cookingwithpizazzPosted in AdventuresTagged Adventures, Food.